<?xml:namespace prefix = st1 ns = "urn:schemas-microsoft-com:office:smarttags" />Panama is located in the middle of the American continent. Through the east lies Colombia and through the west Costa Rica. It forms a natural isthmian bridge, 80 kilometers in its narrowest part, that joins the Atlantic Ocean in the north with the Pacific Ocean in the south. It is a 100% tropical with temperatures around 80-90 degrees Fahrenheit (about 25 – 30 degrees Celsius). There are two seasons: the dry season with a bright sun from December to April and the rainy season from May to November. You can also enjoy temperatures of 12 to 15 degrees Celsius in the highlands of the Province of Chiriqui close to the border with Costa Rica as well as in the Valley of Anton and Cerro Azul at one hour and a half and 40 minutes from downtown Panama City respectively. Good News!!! Panama is situated south of the hurricane track and generally not affected by these tropical storms. Panama covers an area of 75,517 square kilometers with more than a 1,000 miles of coasts and 1,000 islands on the Pacific side and 800 miles of coasts and 600 islands on the Caribbean side. 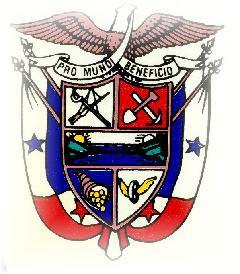 There is an estimated population of 2,329,329 (1990 census) with 40% residing in Panama City. 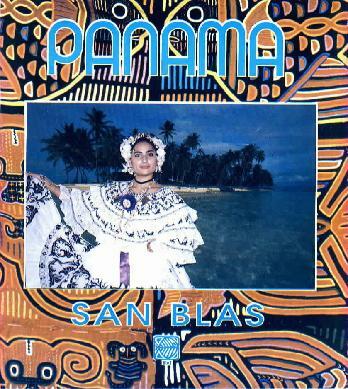 Spanish is the official language but most Panamanians speak English fluently. Visa, American Express, Master Card and Diners Club credit cards are accepted in most hotels, restaurants and commercial establishments. Panama’s electrical grid covers the whole country; 110-volt AC is found nation-wide. Panama has an excellent telephone and communications system which can be considered the best in Latin American and one of the most sophisticated in the world. There is potable water in all towns; qualified as one of the purest in the world, it is safe to drink directly from the faucet. Transfer from Tocumen International Airport to downtown is provided by airport taxi or limos at two different rates: US$20.00 for a maximum of two persons or US$24.00 for a maximum of three passengers. In the City, taxis are inexpensive and almost constantly available. The fares vary according to the number of zones you travel. Going outside the city limits can cost up to $10.00. Taxis waiting at hotel entrances are air-conditioned and a little more expensive but some of the drivers are trained guides and speak English or can understand it. Buses to the interior are also comfortable, air-conditioned, with reclining seats and stereo music and very affordable. Foreign driver’s licenses are valid for up to 90 days. Speed limit is 90 km/hr. Gas stations are easy to find on the Pan-American Highway except from Panama City to Darien. Panamanian Immigration has waived visa requirement for many countries. Check with the Panamanian Consulate in your Country of residence and you may discover that a visa is no longer needed. In most cases a tourist card is sufficient and can be bought before boarding the plane at the airline ticket counter or at the Immigration Office at Tocumen International Airport after you have arrived in Panama. Tourist Cards are valid for 30 days however you can get a two-month extension at the Immigration and Naturalization Head Office in Panama City, if you submit a request 7 days before the first 30 days have expired. All tourists must pay an exit tax of $20.00. Bring light clothes. Panamanians are very casual most of the time but a light suit is worn for business and for visit to government authorities. Never forget to include a bathing suit when packing your suitcase. Sun glasses are recommended as well as sunscreen lotion for protection against sunburn. If you visit the highlands of Chiriqui Province, bring a light sweater or jacket since it can be a little chilly in the evening and early morning. Good waling shoes are necessary for your excursions. There is no restrictions on what you can bring with you for personal use. Visitors are allowed up to two cartons of cigarettes, five bottles or a gallon of liquor. A duty free zone is located at the airport before entering Customs and Immigration and is useful for last minute shopping for a gift for your friends or hosts in Panama. Panama is a constitutional republic. Executive power is held by the President assisted by two Vice-Presidents and an appointed Cabinet of ministers. The Judicial Branch is composed of a Supreme Court of Justice with nine judges appointed for 10 years terms; five superior courts, and three courts of appeal. The Legislative Branch is unicameral; the President and the legislator are elected through popular vote every 5 years. Panama is divided into nine provinces with their respective capitals. Each province is in turn divided into districts, municipalities and administrative units called corregidors. Because of its key geographic location, Panama’s economy is service-based, heavily weighted toward banking, commerce and tourism. The Colon Free Zone and the Panama Canal play a very significant role in the country’s economy by generating employment and services. Another important employment generator is the Trans-Isthmian Pipeline, which goes from ocean to ocean, from Puerto Armuelles in the Province of Chiriqui to Chiriqui Grande in the Province of Bocas del Toro. Panama has the largest merchant marine registry in the world. This service represents the biggest foreign currency earner for the country. The main export products are bananas, rice, corn, sugar cane, coffee and shrimps bought mostly by Costa Rica, Germany and other European countries. Like all Latin American countries, Panama is predominantly Catholic but other denomination are found throughout the country. The Panamanian Institute of Tourism (I P A T) is the national tourism office; it is located in the ATLAPA Convention Center on Israel Avenue. This is the most exciting sea encounter, and it is one of the most interesting alternatives for tourism adventure in Panama. If you are a professional surfer or a surfing fan, Panama provides a singular variety of beaches on both oceans that have the ideal surge for surfing. National and international matches of high technical and professional quality are held annually in Panama taking advantage of the enormous waves of the Panamanian Pacific. Beaches like Santa Catalina and Mariato in Veraguas Province and Playa Venao in Los Santos Province, are scenes of important regional surfing matches becoming a real attraction for those who practice the sport as well as for those who only go out to enjoy the beaches and to watch the impressive waves. The specialists in this challenging sport have selected several beaches in Panama for the youthful practice of "riding" waves. On the Pacific, the Beaches of Lajas, Coiba and Cebaco Islands, the Beaches of Punta Brava, Cambutal, Raya, Guanico, Desfiladero, Madroño, Rio Mar, El Palmar, Teta, Serena, Malibú and Jaqué. On the Caribbean, Playa Palenque, Isla Grande and Maria Chiquita in Colon Province, and in Bocas del Toro Province, Bluff, Dumpey and Punch beaches. Make an appointment with your specialized tour guide to get a wide range of opportunities to practice this sport in Panama every month of the year. One of the main characteristics of Panama's geography, besides its abundant green areas, are its tropical jungles traversed by extensive rivers with their abrupt trajectories. In some of them that run towards the Pacific and the Caribbean there are appropriate scenarios for river rafting. If once you dreamt of doing it, this is the best moment to experience it in Panama. Panama has a wide range of rapids classes. We have class III rapids in the Chagres River and class IV rapids in Mamoni River, and in Chiriqui province you can practice safe river rafting, all year long in two natural scenarios: Chiriqui River, a class III, IV and V!! river, available all year long, affording a real challenge during the months from April to December. Tour Operator in Panama provide everything that is necessary to enjoy this adventure, and help you find in these deep rivers the degrees of difficulty that visitors demand. The same is true of the opportunity to practice this exciting adventure thanks to the extensive trajectory of the river and certain demanding stretches where you can experience the greatest challenge of your life with nature. Here are some pictures of our rivers, courtesy of Aventuras Panamá. Come and enjoy yourself. Panama is a maritine country par excellence. Its history and its economy are linked to the sea. It has coasts on the Caribbean (1.207 km) and the Pacific Oceans (1700,6 km). This privileged geographic condition has generated important marine and coastal zones full of aquatic and land ecosystems like marshes, beaches and coral reefs that form incredible landscapes of submarine flora and fauna on both coasts. In the Panama Caribbean specialists are astonished with the extraordinary submarine beauty of the North and South Zapatilla Keys in the province of Bocas del Toro within the Maritine National Park of Bastimento Island, as well as around the waters of Punta Vieja (Old Point), Punta Hospital ( Hospital Point), Donato, Crawl Cay, Stern Island, Tiger Cay, Wild Cane Cay and Agua Oeste Cay. On Colon Island tour operators provide equipment and guides for safe scuba diving any time of year. The San Blas Archipelago is famous all over the world for its wonderful islands of coralline origin and its crystalline waters where scuba diving and snorkelling are some of the main activities. The best months for diving are April, May, November and December. There are meeting sites for scuba diving and snorkelling like Portobelo Bay, Isla Mamey and Isla Grande. It could turn out to be a great adventure to dive in these waters full of the history of pirates and privateers from the XVII century, where stormy battles took place and where the mortal remains of the famous pirate Sir Francis Drake, were laid to rest at sea in a leaden casket. The best diving months are April, May, November and December. In the Pacific Ocean there are ample zones of subaqueous beauties like Coiba Island, in the Coiba National Park, that has the most extensive coralline reefs of the Central American Pacific becoming a great natural aquarium. Another possibility is to visit the Chiriquí Marine Gulf National Park where there are species of great size like whales and dolphins among others, or enjoy scuba diving or "snorkelling " to feel the emotions of being in a multicolored aquarium. In these two areas the best months for diving are December to March. The Islands of Contadora and Taboga in the Archipelago of las Perlas (the Pearl Archipelago), are the diving sites nearest to Panama City. These Islands have facilities for the full-featured sport of scuba diving with or without a tank. In the Wild Life Refuge of Iguana Island there are very well preserved coral reefs that can easily be observed at shallow depths, an excellent and calm site to dive. The waters next to the Panama Canal, specifically Gatún and Alajuela lakes are also a unique diving destination. Perhaps this is a different diving experience, because the attraction consists in seeing at the depths the remains of the first trans-isthmian railroad and the old dredges that excavated the Canal pathway. 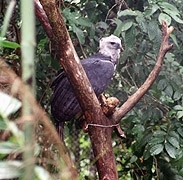 Panama is recognized world-wide for having several "world records " for bird count and observation. Similarly it has occupied the first places as far as the number of birds observed in 24 hours, since 1970. The Audobon Society a scientific organization specialized in the observation and conservation of birds undergoes the traditional Christmas count in the River basin of the Panama Canal, having divided this area in three observation sectors: Pacific sector,Central Sector and Atlantic Sector. The country has scientifically registered more than 940 species of birds, that are mainly located in: the Sovereignty National Park, Metropolitan National Park, Chagres National Park and Darién National Park. Along the old Pipe line, Plantation Road (Soberanía National Park), and Gamboa (that provides lodging facilities), you can experience being at the location where the maximum amount of birds can be observed within a reduced area and in a short period of time. These sites are readily accessible from the capital city (15 to 30 minutes away) where you will find comfortable hotels and tour operators with specialized guides. The Harpía Eagle (harpya Harpia), one of the most impressive birds of prey of the humid tropics has its habitat in the Darién National Park, where it is possible to encounter the specie if you invest a little time and patience in a trip full of adventures. But if time is a constraint, you can observe it in captivity at the Summit Botanical Garden, in adequate exhibition facilities where the majesty of this bird that’s in danger of extinction, is explained in detail. The famous quetzal (phraromachrus Mocino), can be observed in the high lands of the Province of Chiriquí, as well as in the Baru Volcano National Park and in the Amistad International Park whose trail bears its name. Nearby there are hotels, cabins, and tour operators that will prepare bird watching tours to observe the species in their natural habitat. Come and enjoy your stay. The first settlers of Panama date from approximately 9.000 years B.C. From that moment on human presence in the country has left interesting elements in important archaeological sites, like the ceremonial centers of Barriles and el Caño in Chiriquí and Coclé provinces. The Darién National Park is inhabited by the emberá-wuonán or chocoes ethnic group that live in communities within the forest where they conserve their ancestral hunting, fishing and food harvesting customs, as well as their traditional huts that transport us to the indigenous past of America. The Natives of the ethnic group Ngobe-Bugle or Guaymíes inhabit the highlands of the provinces of Chiriquí, Veraguas and Bocas of the Toro where they live amidst green mountains and beautiful landscapes. Their feminine wardrobe presents a variety of colors and geometric forms while male attire presents the " chaquira " ( a multicolor necklace) that can be acquired easily in their communities and crafts shops. They still practice ancestral rites like the " traditional Balsería " and other rituals. Near the Ngobes there is the small indigenous community of the Bokotas, scattered in small villas similar to those that existed when the first settlers arrived on the Isthmus of Panama. To get to the Bokotas village you have to journey into the deepest sector of the tropical forest that is full of adventure, surprises and unpredictable natural consequences. The Kunas are the best known indigenous group of Panama. 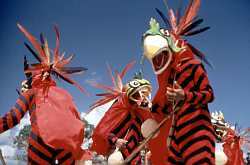 Famous world wide for their handmade Molas and a culture that is very rich in rites and traditions. They have been the subject of anthropological research and extensive T.V. and news articles from the greatest world-wide television networks. They inhabit the Archipelago of San Blas (Kuna Yala Region) in the Estern Caribbean coast of Panama, in islands with coralline white sand and crystalline blue waters, where you can stay at hotels and cabins located in paradise like tropical islands (in the island villages). The indigenous community of Teribe inhabits the rough terrain of the Bocas del Toro Province mountains and the margins of the Teribe River. This group is led by a " King " who governs the community by decree preserving the groups original traditions. In order to visit them it is necessary to undergo the extraordinary adventure of sailing through the Changuinola River on small boats with ouboard motors, where you can observe the impressive rainforest, with its exotic animal sounds, a site worthy of taking photographs to preserve this memorable experience of the humid tropical forest of Panama. Contact your tour operator and welcome to Panama. Inside this church that was built between 1671 and 1677, is the Altar de Oro (Gold Altar) that is an altarpiece structured in the "churrigueresque" stile based on solomonic columns with great finesse and a wealth of decoration making it a jewel of Panamanian Colonial Art. Located in the narrowest part of the American continent and the lowest region of the Panamanian isthmus; it was built by the United States of America from 1904 to 1914 and is still one of the most amazing engineering marvels of the world. The Canal provides easy and reliable crossings from the Atlantic to the Pacific and back for more than 750 thousands vessels. Ships all over the world are built to fit the three sets of double locks that are part of this 80 Km (50 mi) long water way, wich can be visited any time. Even since 8,000 B.C. the Isthmus of Panama has been utilized as a transit route when man wanted to migrate up and down the American continent. A sea level canal crossing the Isthmus has been a dream ever since Vasco Nuñez de Balboa discovered the Pacific Ocean in 1513. In 1534, the King of Spain, Charles V, ordered the first studies for the construction of a canal trough a section of the Isthmus. Altough this idea never materialized, the Spaniards built roads paved with stone that were used to transport, by mules, tons of gold and silver coming from Peru and ound for Spain. Traces of these roads still remain today and can be visited. In 1880, French companies directed by Ferdinand de Lesseps, the builder of the Suez Canal, began construction of the Panama Canal. But after seven years of fighting diseases and the indomitable problems of the jungle terrain, de Lesseps was forced to abandon the project. In 1903, the province of Panama declared its independence from Colombia and immediately signed the Hay-Bunau Varilla Treaty which authorized the United States to start construction of the Canal in 1904. It was completed and started operations on August 15, 1914 when the U.S. cargo ship Ancon made a historic first transit while the war was raging in Europe. The Panama Canal is 50 miles (80 km) long from deep water in the Atlantic to deep water in the Pacific and runs from northwest to southeast, with the Atlantic side entrance around 33 miles (54 km) North and 27 miles (43 km) west of the pacific mouth. The straight-line distance between those two point would only be 43 miles (69 km). 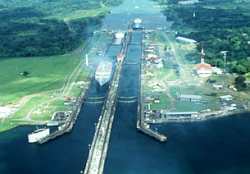 A ship takes approximately 8 to 10 hours to pass through Canal while being lifted step by step to a height of 85 feet (26 m.) in three sets of locks - Gatun, Pedro Miguel and Miraflores. Each lock chamber is 110 ft. (33.53 m.) wide and 1,000 ft. (304.8 m.) long. Most of the trip through the canal is done with nature´s help, as the ships are lifted up by water from sea level to the lake, from where they are lowered to sea level again. Ships going from the Atlantic to the Pacific approach the Canal through Lemon Bay passing the Cristobal breakwater. This span is 6 miles (10 km) long and 450 ft. (152 m.) wide and takes you through some sea level mangroves. Gatun Lake, through which ships travel for 23 miles is one of the largest man-made lakes in the world. It covers an area of more than 163 square miles (425 km²) and was formed by an earth dam across the Chagres river. When navigating the lake you can see scores of small islands, wich really are the tops of former jungle hills. The level of the lake is controlled by use of 14 gates in the Gatun Dam spillway. A hydro-electric plant at the dam provides part of the energy needed by the Canal. The operation of the locks consumes a prodigious amount of fresh water. Each time a ship passes through the waterway, about 52 million gallons of water, mostly from Gatun Lake, must flow into the locks and out to sea. In all Panama Canal locks, chambers are filled and emptied by gravity, water flowing through a series of 18-feet diameter tunnels allowing the filling and emptying of a chamber in 10 minutes. The workforce of the Panama Canal Commission is made up of approximately 9,000 U.S. and Panamanian citizens. Due to the vital importance of water for the Canal's operation and the direct inter-relation between the rainy tropical forest and the pluvial precipitation, wooded areas that were been converted surround the Canal into satate managed national parks and biological reserves. In addition to ensuring the water supply, these protected areas are also used for eco-tourism as well as for scientific research. The Chagres National Park covers 320,000 acres (129,000 ha. )of rainforest that provides 40.0% of the fresh water that goes into the inter-oceanic waterway. The Soberania National Park of 55,000 acres (22,104 ha) is a perfect example of tropical forest boasting an amazing biodiversity. More than 150 species of birds can be found of this area and the forest contains over 200 unique plant and animal species. Another well known feature of the Park is the Las Cruces Trail, also called "the jungle road" or "Madden Road". It was the main trade and passenger traffic route from 1530 to 1855. This trail, a predecessor to the Panama Canal, was also used by fortune seekers traversing the Isthmus during the 1849 - 1850 California Gold Rush. What is left today is only a six-mile trek through the tropical forest. It can easily be walked, especially during the dry season. In the largest section of the Canal (Gatun Lake), the Barro Colorado Island was declared a biological reserve in 1923. It offers a great variety of plant and animal life, especially monkeys, and has become a worldwide recognized site for scientific research. Since 1946 it is under the administration of the Smithsonian Tropical Research Institute. Without forest there is no water, without water there is no Canal. Bilingual guides will give you all the details, information and statistics. At the visitors center, a topographical model and pictures provide more information about the operation of the Canal. After World War II, the evolution of special vessels, particularly the container ships, revolutionized the shipping industry. The Canal changes with the modernization of the world´s merchant navy, meeting this challenge in order to become the most efficient maritime transport alternative in the world. An aggresive maintenance program has kept the Panama Canal in Optimum operating conditions and will ensure its useful life and competitiveness for many years to come. A new treaty signed by the U.S. President Jimmy Carter and Panama's Head of Government the late General Omar Torrijos, went into effect on October 1st, 1979. It created the Panama Canal Commission as the agency responsible for the overall management of the waterway until the year 2000 when the treaty expires. 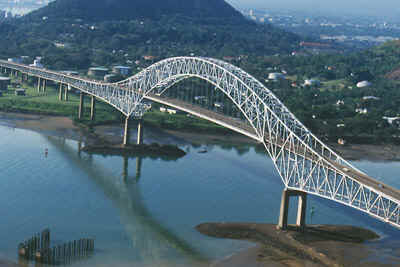 The treaty requires that Panamanians participate increasingly at all levels in the canal's management in preparation for Panama's total assumption of responsibility for its operation at the end of the century, when at noon on 31 December 1999 the Canal and all others areas previously under US Administration will completely revert into Panamanian hands. A boat traveling from New York to San Francisco saves 7,872 miles by using the Panama Canal instead of going around Cape Horn. The highest toll paid for a transit through the Panama Canal until 1995 paid by the Crown Princess on May 2, 1993; it was US$141,349.97. The lowest toll paid was US$ 0.36 and was paid by Richard Halliburton who crossed the Canal swimming in 1928. Each door of the locks weights 750 tons. Panama La Vieja (Old Panama) is the name used for the architectural vestiges of the Monumental Historic Complex of the first Spanish city founded on the Pacific coast of the Americas by Pedro Arias de Avila on 15 August 1519. This city was the starting point of the expeditions that conquered the Inca Empire in Peru (1532). It also was a stopover point of one of the most important trade routes in the history of he American continent leading to the famous fairs of Nombre de Dios (God’s Name) and Portobelo where most of the gold and Silver that Spain took from the Americas passed through. The fire, destruction and pillage that was caused by Henry Morgan in 1671 provoked the move and construction of a new city in 1673, which today is known as the Old City Center or Colonial Panama. Old Panama is one of the urban attractions that can easily be visited and seen while walking through its old stone paved streets now overgrown with grass to appreciate its 476-year old history. Currently a new archeological project was started on this site with the idea of protecting and restoring the ruins. The administration of the project is run by a foundation that is a joint force between the government, a civic club and private enterprise. The Isthmus of Panama was visited by the Spanish conquerors for the first time as the result of an expedition organized by a wealthy solicitor from Triana, Rodrigo de Bastidas, in 1501. Bastidas traversed the north coast from the Gulf of Darién, through the Kunas Islands, to what is today known as Portobelo. After collecting a wealth of gold and pearls, Bastidas had to suspend his expedition due to the poor condition of his ships and return to Spain with only a portion of the treasure. Panama, Where Spain Founded the First City. On October 10, 1502, Christopher Columbus arrived on the coast of Veraguas and was mesmerized by the gold jewelry worn by the Indians. Several weeks later, on November 2, the discoverer came upon a beautiful protected bay, which he baptized with the name Portobelo. 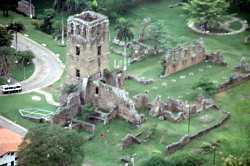 It was on Panamanian soil that Spain founded the first city on solid ground: Santa María la Antigua del Darién. On September 25, 1513, Vasco Núñez de Balboa discovered the southern sea and connected the Pacific Ocean with the Caribbean Sea for the first time, forever sealing Panama's fate and strategic importance as the bridge of the world. Toward the end of the 1500s and throughout the 1600s, Panama was an important center for conquistadors, smugglers and famous pirates such as Henry Morgan and Francis Drake, who pillaged and destroyed cities. Panama Cuts Ties with Spain and Joins the Americas. In 1821 the isthmus gained its independence from the Spanish crown and became part of Simón Bolívar's Gran Colombia. This military leader convened a caucus in Panama in 1826 with the objective of creating a great confederation between Gran Colombia, Central America and Mexico. But he was never able to realize his dream. Gran Colombia was dissolved and Panama became part of Nueva Granada. Los Carnavales son el evento anual más esperado por todos los panameños, su popularidad es comparable en América Latina con los famosos carnavales brasileños, tanto en participación popular, alegría, así como en sus esplendorosos disfraces y alegorías folklóricas populares. Todo el país se vuelca a las calles por cuatro días y cinco noches en una verdadera multitud de personas de todas las razas y estratos sociales juntos con un solo objetivo: la diversión. En las mañanas, las “mojaderas” refrescan el calor tropical; en las tardes los desfiles y paradas con “Reinas” de extravagantes y lujosos disfraces en carros alegóricos, acompañadas de “comparsas” y “tunas” son el deleite de chicos y grandes. En las noches los bailes populares en sitios públicos y avenidas culminan un día lleno de actividades festivas. Las horas de descanso son pocas pues tan pronto el sol calienta se inicia nuevamente la fiesta. Venga, compruébelo y viva su propia experiencia en los carnavales de Panamá. Contacte los tour operadores o agencia de viajes y programe su diversión y esparcimiento a su medida. Este año 2003 los carnavales se inician la noche del viernes 28 de febrero, con un regio programa de celebración, con la coronación de las “Reinas” en las Ciudades de Panamá, Penonomé, Chitré, Las Tablas, Capira, Chepo, Penonomé, y Dolega. Todos estos lugares del interior del país son escenarios abiertos de diversión y alegría, donde se muestra toda la espontaneidad del hombre y la belleza y donaire de la mujer panameña. El Carnaval de la Ciudad de Las Tablas, en la Provincia de Los Santos, a 282 kilómetros y a 4 horas de la Ciudad de Panamá, se ha convertido en el más famoso del país y en un verdadero espectáculo de lujo y belleza de fama nacional e internacional. Su bien ganado prestigio obedece al lujo de los disfraces y carros alegóricos que exhiben las Reinas, que son la atracción principal de la fiesta y el símbolo de las tunas de Calle Arriba y Calle Abajo, quienes compiten para ofrecer el mejor derroche de fantasía, color y alegría a quienes gozan de este carnaval. En las Tablas, se congregan en una pequeña plaza miles de personas para disfrutar excitantes actividades festivas como los llamados “culecos”, que no son más que bailes populares al aire libre donde los participantes son bañados constantemente por agua limpia que se lanza desde carros cisternas. Hay momentos en que la diversión llega a su clímax cuando las Reinas desfilan con lindos disfraces para saludar a los participantes bajo los picantes acordes de los cantos y música típica de las tradicionales tunas. El lujo y el esplendor se toman las noches en el Carnaval Tableño pues se inicia las simpáticas rivalidades entre las “tunas” de calle arriba y calle abajo (simpatizantes de cada de las Reinas) que cantan tonadas folklóricas y bailan alrededor de impresionantes y majestuosos carros con alegorías para cada uno de los 4 días de fiestas. La diversión en las Tablas no tiene límites, Usted debe venir preparado para disfrutar un sinnúmero de actividades festivas. Las Ciudades de Panamá y del interior del país cuentan con todos los servicios turísticos de hospedaje, alimentación y comunicaciones que le permitirá disfrutar con mucha seguridad de una de las fiestas populares más grandes del Continente Americano. Lo invitamos a que la viva personalmente. Venga, Panamá le espera…. Cut the fish into bite-size pieces and place in a glass bowl or container of at least 2 inches high. Add all the other ingredients, mixing well. The lemon juice should cover the fish. Cover with plastic wrap and place in the refrigerator. Allow one day for fish to cook in the lemon juice and onions. Serve with crackers or saltines. This is one of my favorite recipes, try it, it's really good! Drain all the liquid from the ceviche. Add all ingredients and mix well. Correct curry if necessary, depending on taste. Let rest at least one hour in the refrigerator and serve with "canastitas" or crackers. ** Culantro is an herb belonging to the cilantro family. It is a long green leaf with a strong flavor and aroma. If you cannot find it in your local grocer, you can use cilantro instead. Season the fish with the garlic salt, paprika, white pepper and curry powder. Dip the pieces in the flour and fry them in hot oil until lightly browned. Drain and place in a glass bowl or pyrex dish. Take the fish out of the oil and add the garlic, pepper and onion slices and cook from 3 to 5 minutes. Place the vegetables in a bowl and add the vinegar, water,salt,bay leaf and paprika. Mix well. Pour this mixture over the fish and let cool. Cover with plastic wrap. Place in the refrigerator for 24 hours. Serve cold. Place the chicken breast on a pot, cover with water and add the sliced onion, 1 tsp. salt and a dash of white pepper. If you like you can also add some chopped cilantro leaves. Let cook until the chicken breasts are done. Let cool in the liquid. Take the skin off the chicken breasts and also take out the bones. Cut the chicken meat into small cubes. Place in a large bowl or jar. Now add all the other ingredients on the list and mix well. Season with salt and pepper, add some cayenne pepper to taste too. In Latin America we prepare a lot of spicy dishes and this is supposed to be somewhat hot, but if you don't like pepper you can omit it. Also add some chopped cilantro leaves, if you like. Let this marinate overnight in the fridge and serve cold with crackers. This makes a very nice hors d'oeuvre. Mix all ingredients in a large jar or glass bowl and cover with plastic wrap. Let stand in the refrigerator overnight. Serve cold as an hors d'oeuvre with saltine crackers. In Panama, we serve all kinds of ceviche in little pastry cups called "canastitas" or "little baskets". They are made of short pastry dough and baked in very small individual quiche molds or mini tart molds of 1 inch diameter. Here we can buy them everywhere and they are usually sold by packs of 24. For parties we order by hundreds. If you live near a bakery shop you can maybe get them to prepare them specially for you. Boil the yuca with salt but do not allow to get too soft. Grind it and knead same with salt. Form balls and fill each with the stuffing, shaping same into oval shape. Then fry in very hot oil. TO MAKE FILLING:Season ground meat with salt, worcestershire sauce, vinegar, capers, onion, sugar, scallion and parsley. Fry in hot oil and when brown add other ingredients and tomato paste. Allow to cook on low fire until soft. Cut the chicken into pieces and season with salt, pepper and orange juice. Let stand for 1 hour. Heat the olive oil and brown the chicken pieces. Take the chicken out of the pan and add the chopped onion, green pepper and garlic. Cook for 3 to 5 minutes and add the tomato puree. Continue cooking for some more and the chicken and the rice. Stir well and cook 3 more minutes. Add the stock, salt, green olives and capers. Cover and cook over high heat until it boils and the rice pops. Uncover and lower heat. Pour the wine over the rice and continue cooking until the rice is completely cooked and the chicken is tender. Take the chicken out of the rice and take the meat off the bones. Return the chicken meat to the rice and stir well. Add the peas. When ready to serve, put on a serving dish and decorate with the red pepper strips. 8 servings. Soak the corn overnight in water. The next day, discard the water and replace with more fresh water, cook over moderate heat until the corn is tender. Drain and pass through the meat grinder. Add the hot water and the 2 Tbs. vegetable oil. Work well to obtain a smooth, soft dough. Cover and let rest while you prepare the filling. Heat the oil in large saucepan and add the achiote. Cook until all the color comes out, strain the oil and discard the achiote. Return the oil to the saucepan and cook the chicken pieces until golden brown. Take out the chicken from the saucepan and add the onions, garlic and bell peppers, cook until soft but not brown. Add the tomatoes, culantro, hot pepper, salt and wine. Add the chicken and the pork. Cook slowly until the meats are tender, correct the salt if necessary. Add part of this sauce (without the meats, to the corn dough and knead until soft. Keep the meats to the side. The plantain leaves are lightly passed over a slow fire, then cut off the middle vein and pass a damp cloth over each piece of leaf. Put 2 or 3 leaves overlapping each other and then place some corn dough in the center, spreading evenly. Place a heaping tablespoon of meat, a strip of pimento, a prune, and 1 or 2 olives and more corn dough on top. Now fold over and wrap well in the plantain lead and tie with a string. Fill a pot with boiling water and put the tamales in to boil for 1 hour. On the upper pan of a double boiler place the sugar with 1/4 cup water to make a caramel. Mix the milk, eggs, vanilla and sugar and pour in the caramel pan. Place over a double boiler and cover. Let cook over medium heat for 1 hour until the custard is set. Let cool completely and then place in refrigerator. Once cold turn over onto a serving dish and serve. TRES LECHES (Three Milks Cake) I have seen many recipes for this popular Central American dessert, but my friend Maria Elena from Guatemala swears this is the original. Make the spongecake: In a the bowl of your mixer place the egg whites. Beat at low speed first and then increase the speed to high until soft peaks form. Add the sugar gradually, letting it dissolve well before adding more, and beat until firm. Add the egg yolks one by one, beating well after each addition. Now mix the flour with the baking powder and add to the mixture alternating with the milk. This operation has to be done quickly or the batter will loose the lightness in it. Finally, add the vanilla. Pour this batter in a large rectangular pyrex,greased and floured, and bake for 25 to 30 minutes in a 350°oven. While this is baking, prepare the cream. Very simple: just mix everything together in a blender and pour over the still warm spongecake. The frosting: Place the water, sugar and corn syrup in a saucepan and let boil. Meanwhile, beat the egg whites to soft peaks. Add the hot syrup in a string and continue beating at high speed until all the syrup has been added. Beat until no longer warm. To serve the Tres Leches: Once the soaked spongecake is at room temperature you have to let it cool in the refrigerator. Then you can spread the frosting and put back in the cold. This is supposed to be served very cold. You can decorate this Cake with Silver dragées or you can also make some caramel and let some strings of it just casually over the frosting. 1 spongecake 9 x 13 in. Prepare the cream: In a saucepan mix the 2 cans evaporated milk, egg yolks, cornstarch, and the sugar and let boil. Let cool for 10 minutes. Cut the spongecake in 1 inch slices and arrange a layer in the bottom of a pyrex dish. Moisten the spongecake with the coconut milk or Coco Lopez. Pour half the cream and cover with another layer of spongecake. Moisten again with the rest of the coconut milk or Coco Lopez. Pour the rest of the cream. Repeat until you finish with some spongecake. Prepare an italian meringue with the egg whites and 2 cups sugar. (see my method for Italian Meringue). Cover the cake with the meringue and refrigerate for at least 6 hours. If you like, decorate the cake with shredded coconut. My Method for Italian MeringuePlace the egg whites and the sugar in a small saucepan. Cook over medium heat and DO NOT LET BOIL. You should test by putting in your finger and the mix should be very hot to the touch. You have to be careful that the egg whites do not cook. You can mix with a wooden spoon. Immediately transfer the mix to the bowl of an electric mixer and beat until the meringue has stiff peaks and the mixture is cool. Mix the crushed wafers with the melted butter and press well onto a 9 inch tart ring or pie mold. Bake at 350°F for 10 minutes and let cool. Beat the milk with the egg yolks and gradually add the lemon juice. This mix will curdle slightly. Pour into baked cookie shell and bake at 350°F for 10 minutes. The center of the pie should be firm to the touch. Let cool completely. Chill. Serve with whipped cream. Place the egg whites and the sugar in a small saucepan. Cook over medium heat and DO NOT LET BOIL. You should test by putting in your finger and the mix should be very hot to the touch. You have to be careful that the egg whites do not cook. You can mix with a wooden spoon. Immediately transfer the mix to the bowl of an electric mixer and beat until the meringue has stiff peaks and the mixture is cool.